Did you see it? 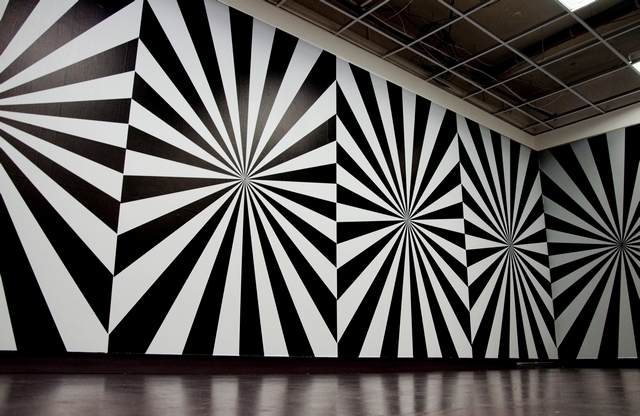 The best street art exhibition of the year? It was in London too, not somewhere overlooking the gloopy mud of the Bristol Channel at low tide. 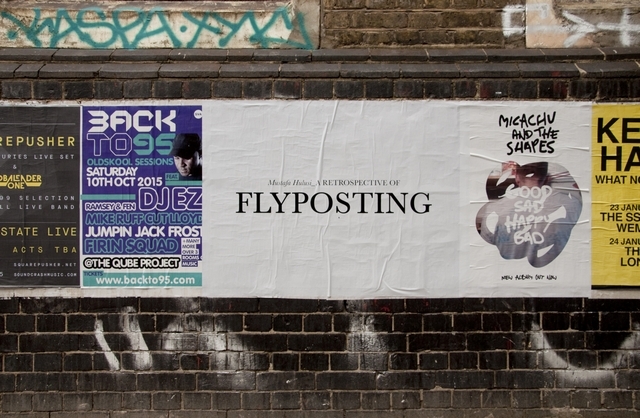 Flyposter clusters around London have been co-opted by Mustafa Hulusi into a multi site conceptual exhibition. 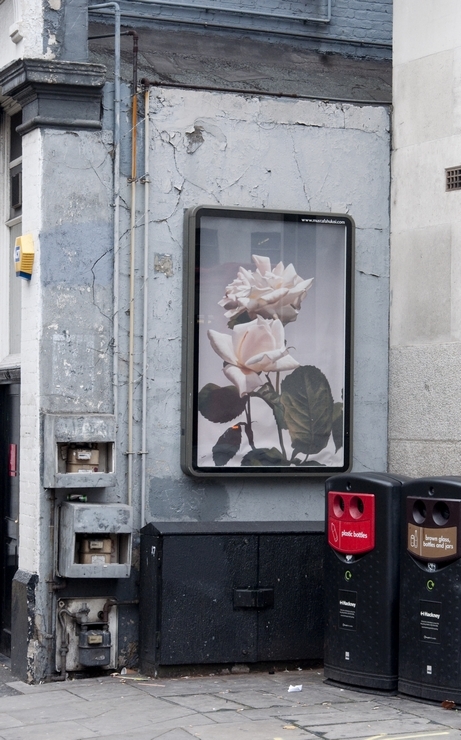 Mustafa Hulusi took the simple, low overhead, moderate risk approach of pasting plain white statements on walls which said “Mustafa Hulusi A RETROSPECTIVE OF FLYPOSTING” . 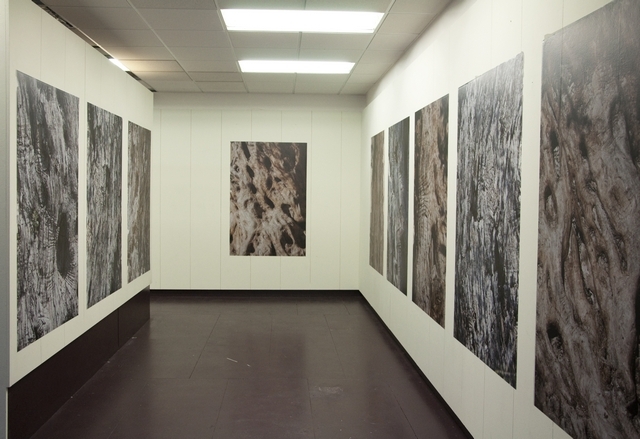 One instant exhibition! 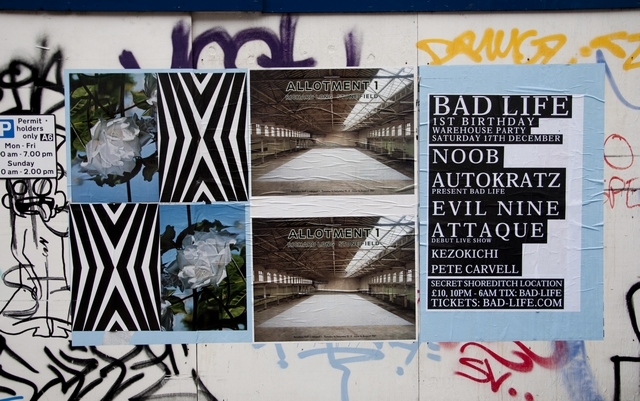 The adjacent flyposters were no longer just illegal adverts, they were non consensual elements of an Hulusi art concept. 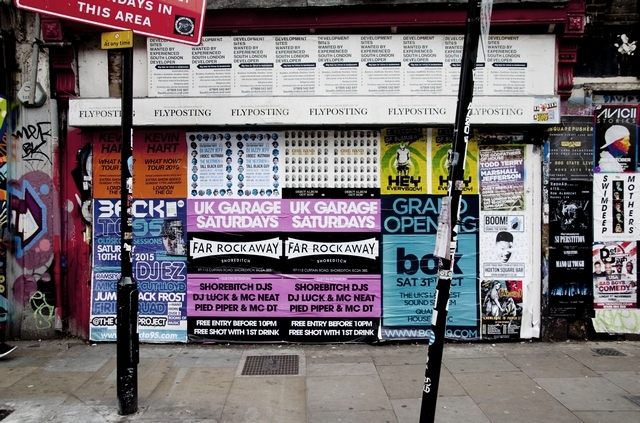 Mustafa Hulusi first came to my attention as a panellist at a talk in Tate Modern’s 2008 “Street Art” extravaganza, he gave an illuminating talk on the commercial imperative of flyposting. He talked about illegal advertising sites, how flyposters couldn’t give a toss about going over street art, it was all about cash and eyeballs. Picking up a few quid as a flyposter, Hulusi used the placement techniques of a flyposter to put his art in the public domain. As a result I have had the pleasure of photographing Hulusi’s art on the streets at regular intervals in the years since. 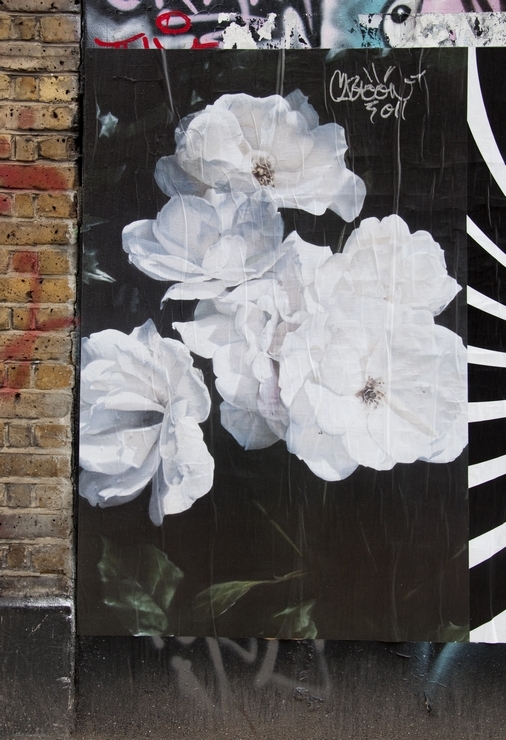 Paste up still life flowers turned out to be stunning photorealistic painting reproductions, these were placed in an illegal advertising spot which Hulusi has been using for several years and indeed still does. The piece above had Graffoto blog compadre HowAboutno and me scratching our heads when we found it as we knew Richard Long was a venerable land artist and the "Allotment I" paste ups next to Hulusi's image puported to advertise a 1987 exhibition, we wondered if Hulusi had put those up as well. 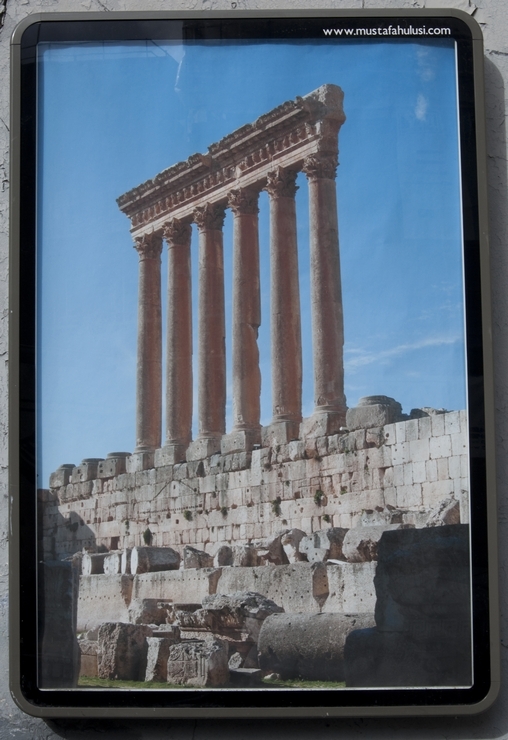 Perhaps Hulusi's Flyposting Retrospective idea in a another form has been fermenting in his mind for quite a while. 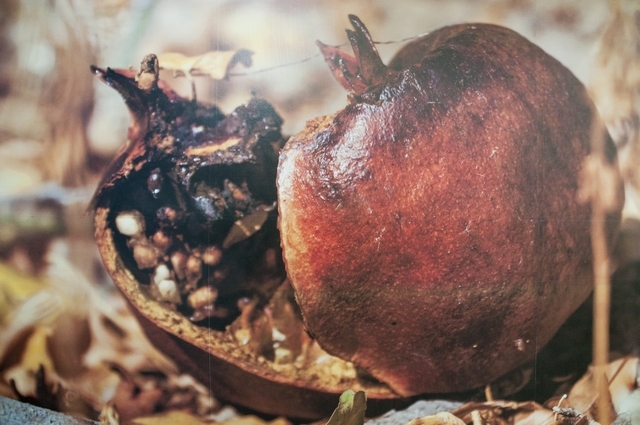 And most recently, a stunning collection of decaying fruit. 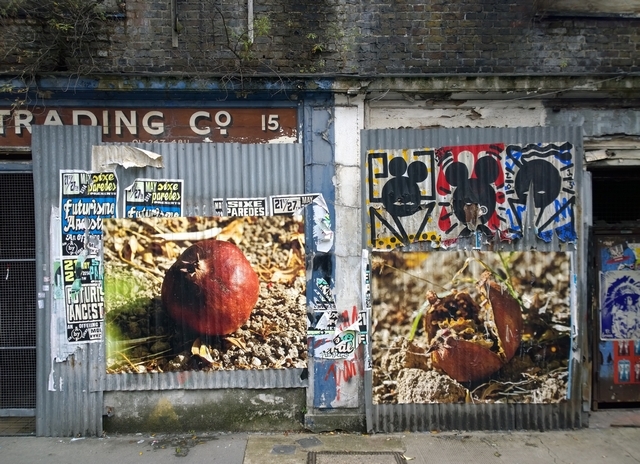 These ones reminded me so much of the death and decay timelapse cameo pieces in Peter Greenaways’s “A Zed & 2 Noughts”. 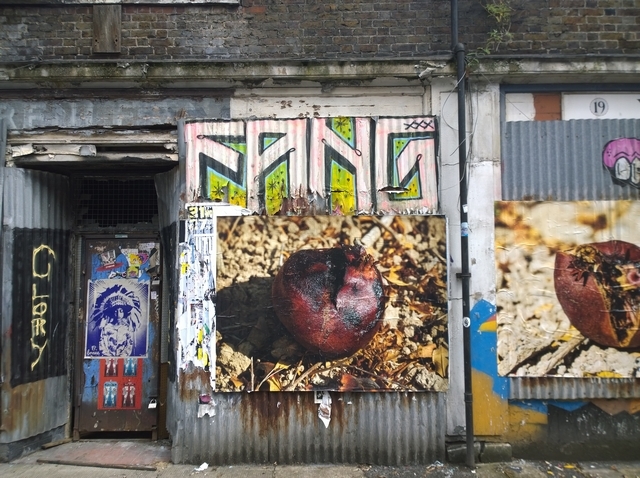 The placement of some of those richly coloured paste ups on Toynbee street puts Hulusi’s work in knowing conflict and competition with flyposting , it being a spot long favoured by clandestine illegal advertisers. 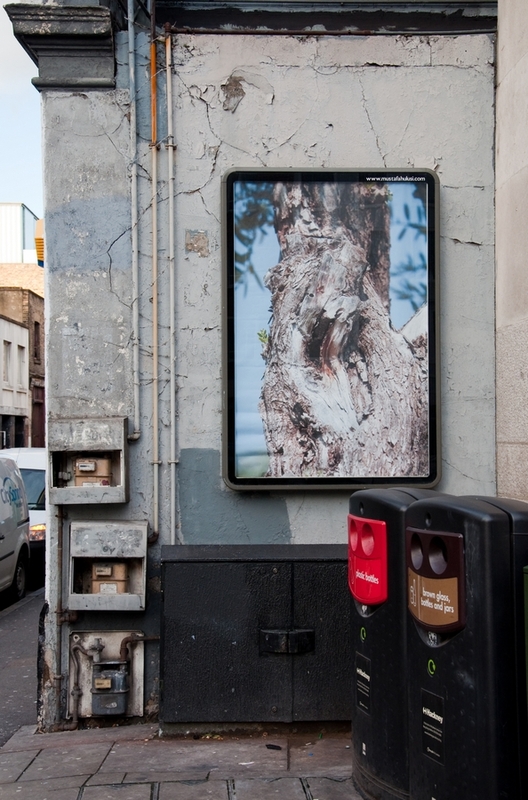 The scale of Hulusi’s work outdoors shows an access to printing facilities few other street artists possess. He also is highly aware of and accesses illegal or abandoned advertising sites. The most obvious comparison in terms of technique is Dr D (in fact I have pondered if Mustafa Hulusi and Dr D might possibly be one and the same but concluded it seems unlikely). Hulusi is a curiosity, his non commissioned and indeed illegal public art lies a bit outside the realm of what would normally these days be considered as street art. A search on the Banksy forum returns “no posts”. He doesn’t court the street art fan boys, my hazy recollection from that 2008 Tate panel talk is that he thought them rather puerile. 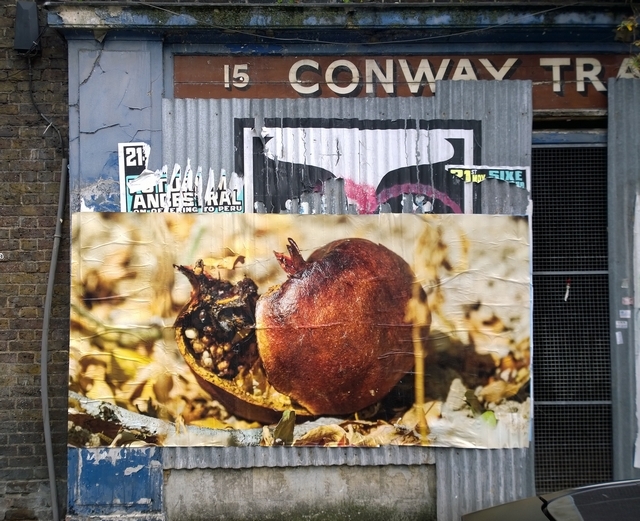 He has avoided the established stencil – print – gallery show street art band-wagon, in fact he sits quite outside and aloof from street art despite regularly placing his work out on the streets. He is fine artist with (thankfully) a bit less academia and a bit more grit. When he does exhibit indoors it’s not to a street art crowd but more to the art establishment, smarty pants with an educated conventional appreciation of art and probably a bit more wedge. 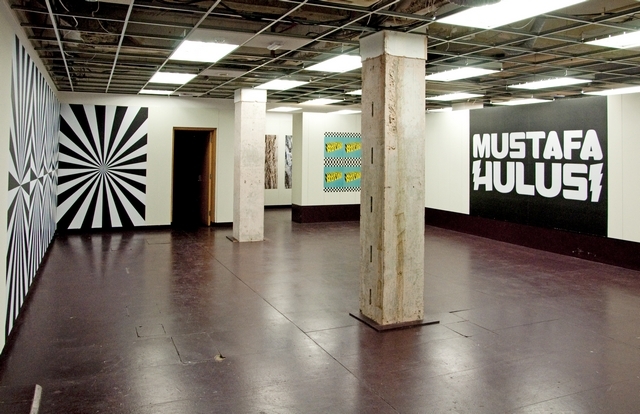 The stark Cass University space houses huge Hulusi staples very carefully pasted to the walls. 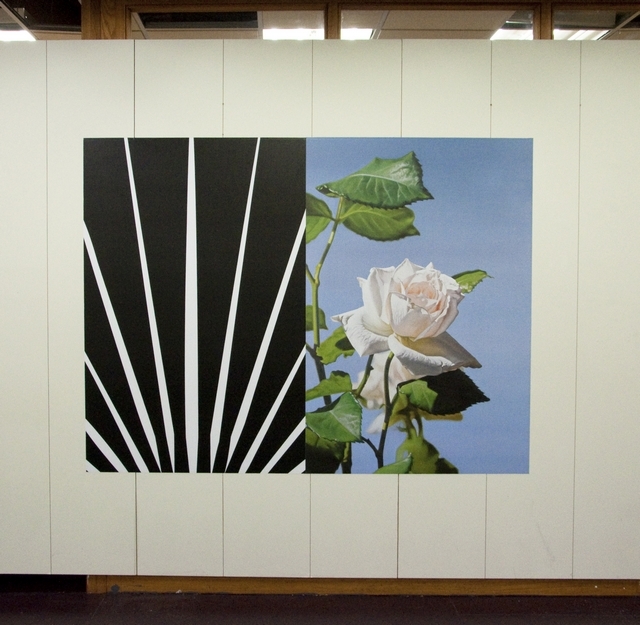 He hasn’t been tempted to go all “street” by for instance roughly layering his art and hanging it at wonky angles or faking a pastiche of faux brickwork and tags. 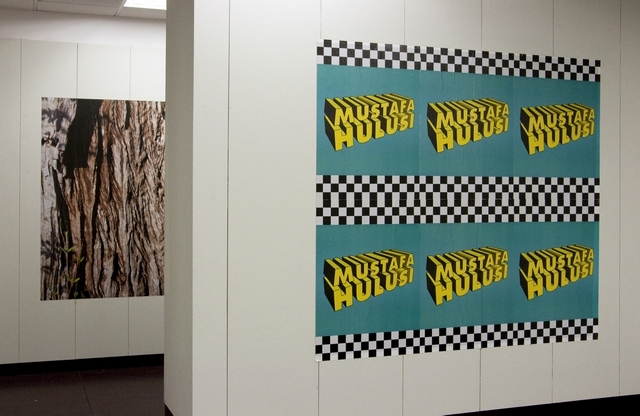 Plain and simple it’s Mustafa Hulusi’s art indoors. 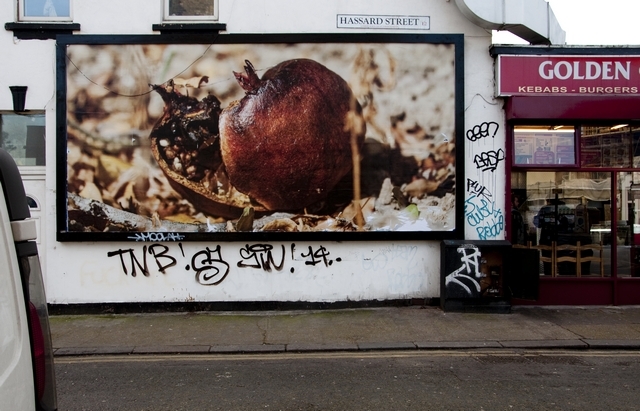 The “pomegranate” series are quite stunning photography. Rust coloured bursting fruit set are against a scorched ash dusted mud and surrounded by brittle papery looking leaves. An arid and lifeless landscape is implied yet there’s a promise of fertility and rebirth. 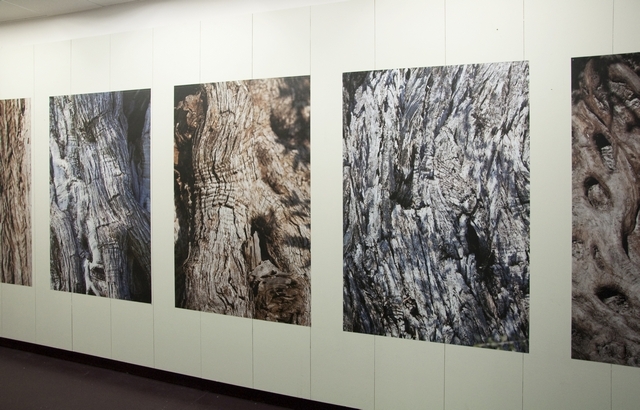 The tree trunks have a mesmerising flow and twist in the grain of the bark. The painted flowers could be something a very patient vicar’s wife might conjure up without leaving her garden. 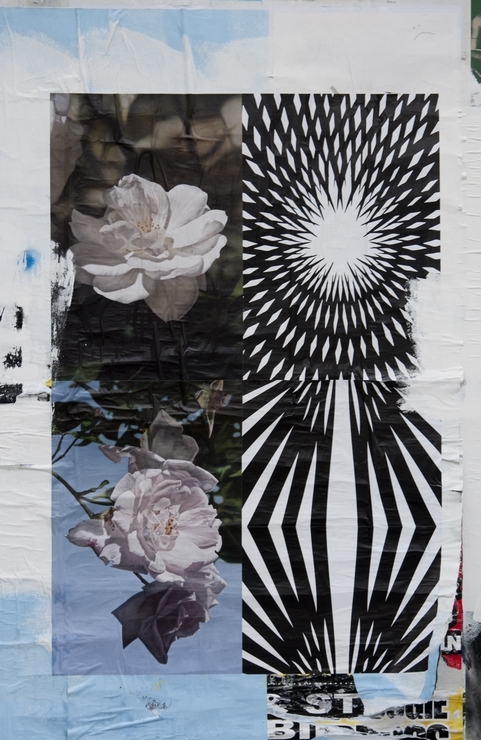 Mustafa Hulusi places his art around the streets but his practice borrows more from graffiti and flyposting that from Street Art. 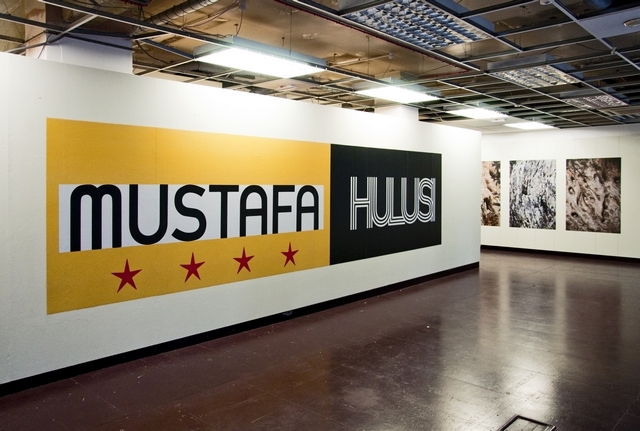 At the heart of graffiti is a letter fetish, Hulusi lifts the ego and font fascination from graffiti but renders his name in crisp graphic letters owing no debt to graffiti pieces. A takeaway collection of Hulusi’s photographs in large paper magazine format looks like it might be a gallery souvenir but in the way the pages unfold to double size, Hulusi is encouraging us to participate in the dissemination of his work by perhaps pasting outdoors ourselves – welcome to Hulusi’s world. 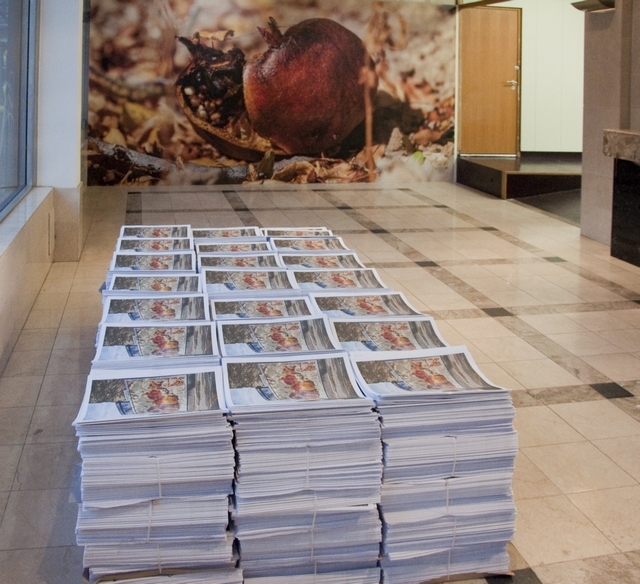 The huge pile of these magazines isn’t a signal that the artist perhaps overestimated a huge audience inclined to get all activist with the wheatpaste but I see it as an installation in itself. 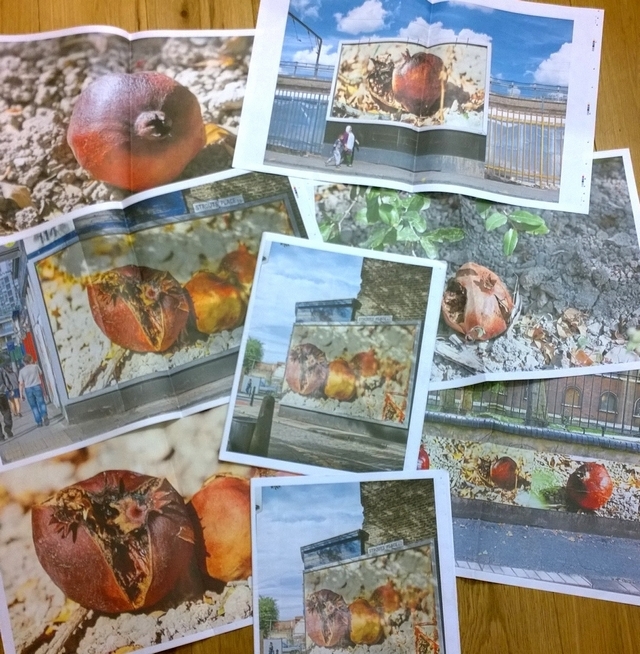 The clues are there, they aren’t placed by the gallery assistant’s window ledge seat to be handed out to visitors, they form a monolithic bed of processed materials in the centre of a room, directly speaking to the images of decaying and transforming fruit in the art on the walls. The images on the walls are Hulusi’s art. 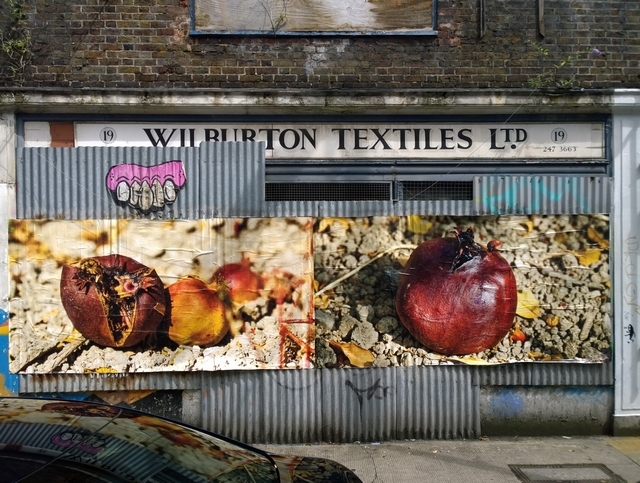 Images in the magazine and in a slide show projection room show Hulusi’s art out in the street. The idea of using real world illegal ads to stage his outdoor “Flyposting Retrospective” neatly avoids the trap of becoming an advert for the gallery exhibition, indeed the clever idea modestly is not actually referenced in the gallery, you could visit the show and leave totally unaware that the street retrospective took place. The gallery show imports Hulusi’s work indoors and the strength of the outdoor work is such that it survives moving inside, in effect the street is not essential to enjoying his art. 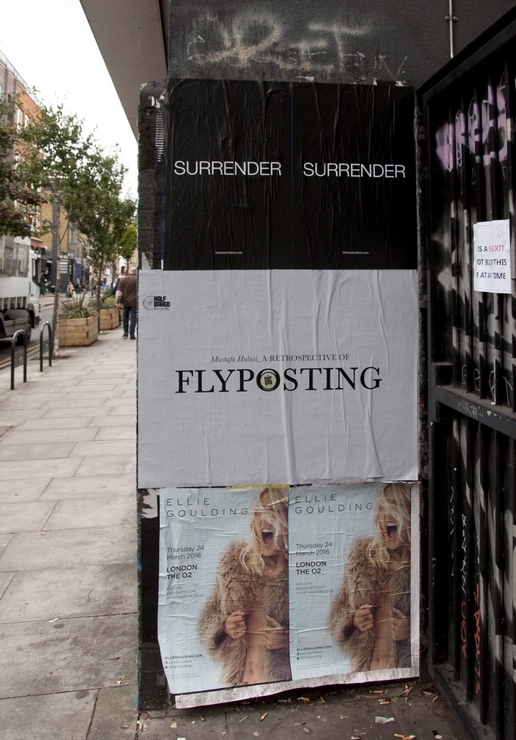 However the outdoors “Flyposter Retrospective” shows how Hulusi’s art engages with the politics of placing art on the streets in terms of its guerrilla annexation of the public realm, its directs augmentation of flyposter locations, its somewhat provocative co-opting of illegal commercial imagery as a vehicle for his art and its knowing nod to the activities of the flyposter business. 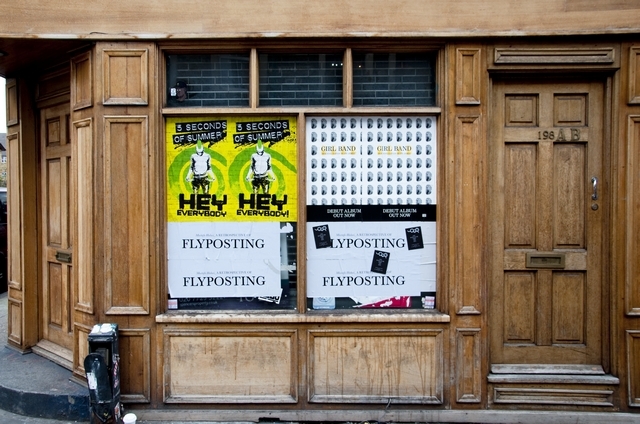 The outdoor “Flyposter Retrospective” and the indoor exhibition “Flyposter” share common concepts but neither specifically refers to the other, they exist independently. 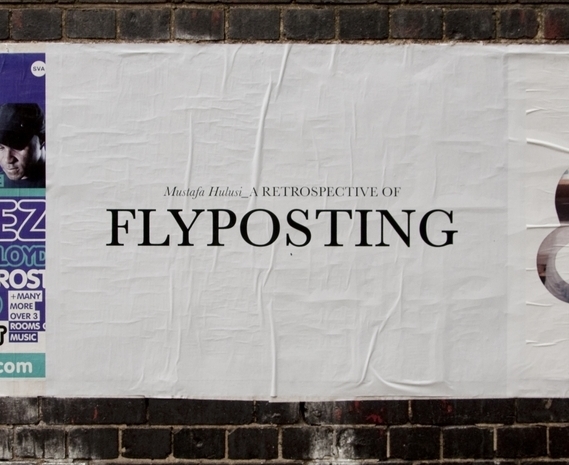 The outdoor “Flyposter Retrospective” stands as the far more challenging and interesting piece of art. Or have I been conned? 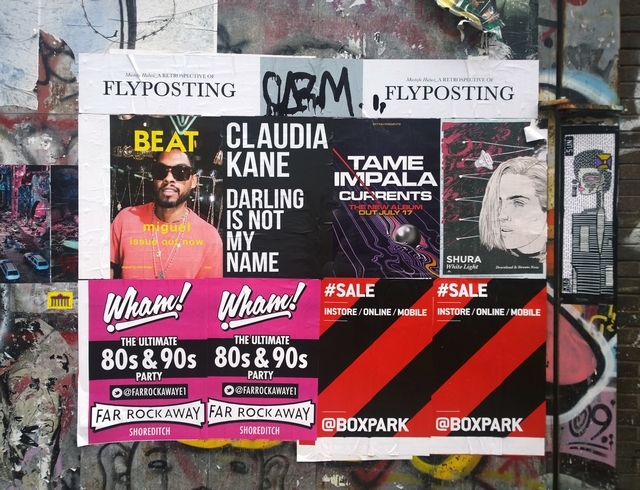 Is the whole Flyposting Retrospective one big advert from someone deeply immersed in product promotion on street walls, in which case I better re-write the whole thing putting Hulusi right alongside all the other street art whores.